Our sincere thanks to those families who supported us in the past by coming along to our Movie Sessions. As other, larger groups are now starting to offer sensory friendly sessions, I will no longer be offering these as I can no longer manage to accommodate families in many different areas who wish to attend. We hope that these will begin shortly through Village Cinemas and will allow a wider audience in all areas the chance to join in. I am extremely proud that we were able to initiate these in Australia! Sensory friendly sessions now run in Victoria, Tasmania and Queensland! 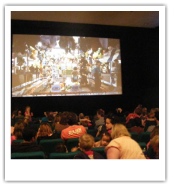 1st Ever Sensory Friendly Movie Session in Australia! 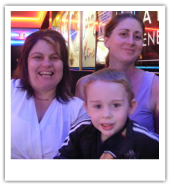 Many families who have children with Autism find it difficult to have outings and find it a challenge to find family activities that are suitable for their special children. Camp Autism launched its Victorian group with the first sensory friendly film for children with autism and their families. 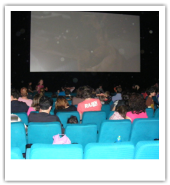 This was held at Waverley Cinemas at the Pinewood Shopping Centre in Mt Waverley, Vic. CA was approached by a mum - Kerry Wylie, along with her sister Stacy Coutlemanis - who both networked with families, organised media contacts and personally donated and sourced many items for our raffle on the day. We were overwhelmed with the response, having hoped to initially fill a cinema of 80 we ended up with 140 attending. This was an Australian first and provided a safe and accepting environment where autistic children and their families can enjoy the film experience. All profits raised from the event will be used to fund activities and future events for Camp Autism. Future sensory friendly events will occur when we can guarantee a large booking to be able to secure the majority of the cinema. This was our article in the Mt Waverley leader.